Al-Jabbar, like the majority of the Names of God, is of an intensified form so it not only means the 'one who compels' or ‘one who restores,’ but the One who does so completely. When Jabbar is used for people, it is negative, because they use their oppressive nature to compel or restore, whereas God can never be oppressive. This Name demonstrates God's Majesty and Strength over His servants. This is a Name for the tyrants and oppressors to be aware of, because their misdeeds will not go unpunished. 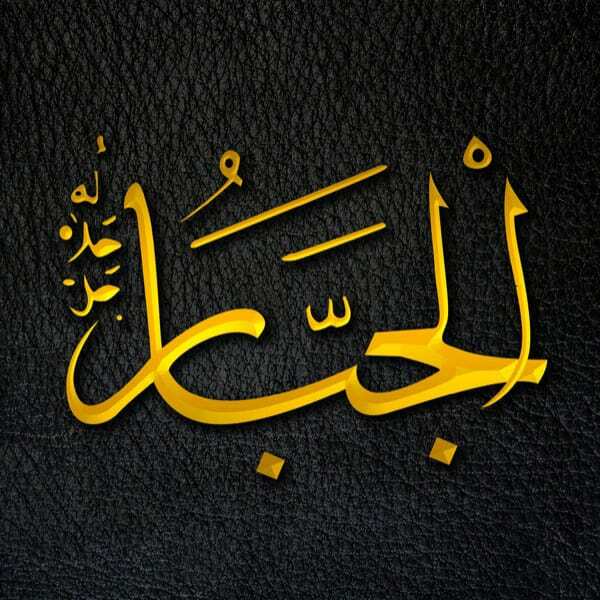 Yet this Name has another dimension: Al-Jabbar is the One who is able to restore and mend what is broken. Some of the great scholars would supplicate “Ya Jaabir kul kaseer” when they were faced with overwhelming difficulty, meaning “Oh You who mends everything that is broken.” The Arabic word for a splint that is used to help an arm heal when it is broken is “jibeera” from the same root ja-ba-ra. Thus, when we feel broken, we need to go to the only One who can mend our state: Al-Jabbar. Sometimes when we get this broken feeling, shaytan (satan) tells us not to go to God because we are being hypocritical by only going to God when we are down. Yet this is untrue – God has named Himself Al-Jabbar and given Himself this attribute; you cannot go to the One whose attribute is mending what is broken, and not be healed by Him.